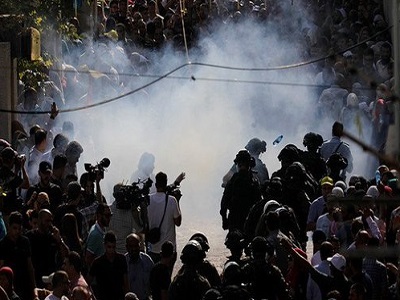 Just one hour after thousands of Palestinian worshipers entered the Al-Aqsa Mosque compound in occupied East Jerusalem for the first time in nearly two weeks, clashes erupted inside the holy site, as Israeli forces fired tear gas and rubber-coated steel bullets at worshipers. The Palestinian Red Crescent released a statement saying that its crews had provided at least 94 worshipers with medical care. According to the group, some worshipers were treated for rubber-coated steel bullet injuries and tear gas inhalation, while others were physically assaulted and pepper sprayed by Israeli forces. 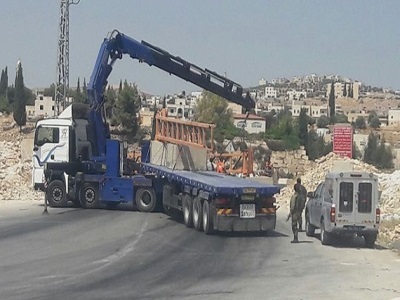 As clashes took place inside the compound, Israeli forces closed the Remission Gate (Bab al-Hutta) entrance to the compound, which was the last gate to be opened on Thursday afternoon before thousands of worshipers poured in for afternoon Asr prayers. Israeli soldiers also took down the Palestinian flags that worshipers had raised atop Al-Aqsa Mosque in celebration when they entered the compound. By 7 p.m., Israeli forces were reportedly only allowing women and the elderly into the compound, according to witnesses. The clashes came just hours after Israeli forces reopened all the gates to the compound on Thursday afternoon, in what was celebrated as a victory by Palestinian Jerusalemites who had been participating in a 13-day long civil disobedience campaign against Israeli-imposed security measures at the holy site. In the span of ten days, four Palestinian demonstrators were killed by Israelis and more than 1,000 others were injured, as Israeli NGO B’Tselem accused Israel of displaying “sweeping disregard” for Palestinian lives in East Jerusalem. Israeli forces have raided Palestinian hospitals, closed off parts of East Jerusalem’s Old City, carried out massive detention campaigns, and violently clashed with Palestinians across East Jerusalem and the occupied West Bank, leaving Palestinian journalists, medics, and children injured in the process.